Introduction: From its violent birth as the surviving portion of a civilization engulfed by invaders to its violent death as a lone city overwhelmed by irresistible assault, the Byzantine Empire was a state walled against perpetual siege. Byzantine fortifications are a diverse and fascinating but also ill-studied subject. Over time, as the empire weathered internal and external warfare, its fortified settlements changed and developed to endure the storm. The relationship between habitation and fortification is often difficult to discern, and varied greatly from place to place and over time. In some places, city walls encompassed a great area, even when only a vestigial community remained inside. In others, small hilltop towns found themselves so packed with activity that the grand open spaces of their Roman heritage were transformed into crowded bazaars. Cities were sometimes divided into upper and lower, other times the city relied upon a citadel, all to provide a more defensible refuge while retaining a larger area for daily life. However, it was the great cities of the empire that boasted the mightiest stone circuits. 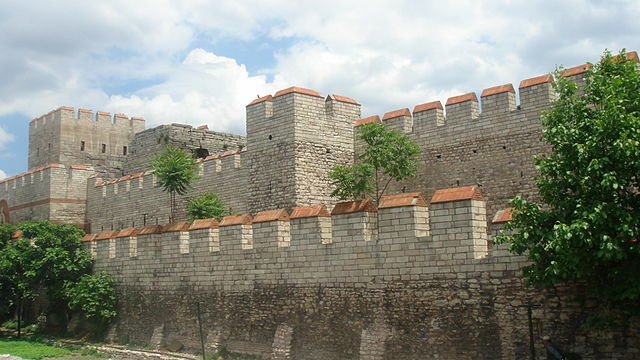 Thessalonica, Nicaea, Antioch, Ancyra and Alexandria were all secured against assault by a higher class of ramparts and even when waves of invaders could wash over the lesser defenses of the hill towns around them, these cities could hold out against all but the most sophisticated and relentless besiegers. The grandest and most impregnable fortifications in the medieval world crowned the landward side of the “Queen of Cities” herself, Constantinople: a six-kilometer, three-layered masterpiece of military engineering that was breached by force only twice in over a millennium. What role did these structures play in Byzantine civilization? Historians have disagreed somewhat about the relationship between walls and the cities they enclosed. For some, it was primarily positive and protective, and walls are understood to have preserved Roman civilization from barbarism. For others, the relationship was negative and constrictive: walls are understood to have choked the life out of the classical polis and reduced it to a martial husk. For some recent historians, walls are understood as regulatory structures used to control commerce, movement and political action. John Haldon, Mark Whittow, Wolfgang Liebeschuetz and Cyril Mango have all offered complex analyses of the social, economic and political dynamics walls imposed upon cities. But regardless of whether historians see walls as benevolent, toxic, intrusive or some combination, almost all historians agree that walls were the product of the imperial state, and whether fortifications were gifts, nooses or restraints, all agree that they were imposed upon the passive urban body by the imperial state.